High glucose levels can be the result of a sugar-rich diet, poor lifestyle choices and an inborn tendency to inadequately process blood sugar. It can lead to pre-diabetes or diabetes itself, a condition whose symptoms include weight loss, fatigue, poor vision, irritability, leg pain and slow-healing cuts and sores. If you are prone to high glucose levels, you may want to take steps to monitor and reduce your blood sugar to continue living healthily. Monitoring your blood for signs of high glucose levels is important, especially if your family’s medical history is rife with diabetes and other blood sugar health issues. Buy only a quality blood test kit from a reputable dealer. You may want to have the kit demonstrated to ensure its functionality as well as learn the proper directions for usage. Make sure your home blood testing kit works properly and supplied with uncontaminated and non-expired strips. 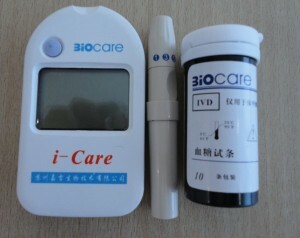 You may also need to replace the batteries and follow diet procedures prior to testing to ensure an accurate result. Existing health problems may also contribute to erroneous readings: check with your physician or the manufacturer to see if the kit is right for you. To minimize the occurrence of high glucose levels in blood, you need to maintain the right diet and exercise. Avoid long periods of physical inactivity, such as sitting in front on the computer for hours upon hours. Simple activities like walking or biking can contribute a lot to the reduction of blood sugar levels. Consult a dietician to compose a low-sugar high-nutrient diet then strictly follow it. High-fiber fruits, oatmeal, beans and peas are low-glycemic foods that can fight high glucose levels. Drinking lots of water will also flush out excess sugar from your system. By regularly measuring your blood for signs of high glucose levels then taking the appropriate steps to counter it, you can fight against the symptoms without having to resort to expensive medication and treatment. Consult your doctor as an additional precaution prior to changing your lifestyle.